There’s something to be said about a player that generates a swirling buzz from Division I athletic departments in such a small, regularly overlooked talent pool. When raw talent supersedes the drawback that is small-town anonymity, however, it undoubtedly gets recognized. 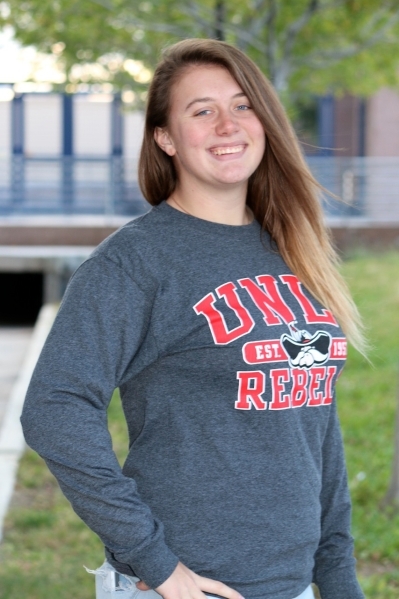 Charlene “Charlie” Masterson, Boulder City High School’s star softball player, took the next step in her athletic career on Nov. 11 when she signed her National Letter of Intent to play for the University of Nevada, Las Vegas. The Lady Eagles’ pitcher, who’s entering her senior season, will begin her collegiate career under the tutelage of former UCLA standout and current UNLV head coach Lisa Dodd. Masterson’s recruitment escalated after her breakout junior season in 2015, when she dominated both on the mound and from the plate. The right-handed hurler, whose fastball tops out at 62 miles per hour, finished her junior campaign with a 0.99 ERA, striking out 215 batters in only 149 innings pitched. She also led the team in opposing batting average (.139) and fielding percentage (.972). Masterson completed the year 18-7 (.714 winning percentage) while tossing two complete games. From the plate, Masterson led the team in every statistical category as well, hitting .515 with 53 RBIs and all four of the team’s home runs. She also had a 1.353 OPS, a statistic combining on-base percentage with slugging percentage. UNLV is known for scheduling tough opponents under Dodd, who consistently lines up the nation’s best teams to test her Rebels will. This upcoming season, UNLV faces four teams that finished ranked in USA Today’s top-25 coaches poll, and two more that were receiving votes. Masterson’s recruitment wasn’t typical of an athlete going to play Division I sports, however. The senior signed her letter of intent prior to informing her teammates or coaches about the decision rather than have a signing day celebration most high school students prefer today. “I’m not a very public person,” she said. Moorhead said Masterson can play anywhere, which is evident from her mind-boggling 2015 stats at Boulder City High School. Coach Moorhead stressed one thing’s for certain: Wherever Masterson lands when those nine players are called upon, she’ll be ready.